Miami is a rough town. Crime, drugs, humidity...but for an enterprising male prostitute, all that matters is satisfying the clients and getting paid. The life isn't as glamorous as it seems, though, as you'll soon find out by guiding our man through one crazy night. 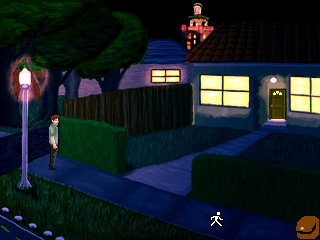 Back Door Man is a point and click adventure game in the vein of the early '90s Sierra/LucasArts classics, made with Adventure Game Studio. The idea stems from one I had for a three-game series featuring three separate characters whose stories interconnect, one game being about this character. This is a condensed version of that game. Explore Miami's diverse neighborhoods, from the filthy rich to the just plain filthy. Entertain the locals with tales of your exploits. - Three separate client scenarios, each with multiple outcomes. - Multiple endings, depending on how you played. - Did we mention you play as a man-whore? Dude, this game is going to be so awesome, I'm looking forward to it. Okay, I confess, I'm the co-designer and primary programmer for this game. Just wanted to drop in and say hi. This is also my first post in the forum. I mostly read the front page of TIGSource, though I've been reading a few forum posts here and there.... I guess it was time to come out of the darkness and contribute in some way! Man, stiff competition this time around. Welcome to the forum! I can finally become the man-whore I always wanted to be with the problems with the law that usually follows! Wow, this game looks great... and sounds BIG! I'm holding my thumbs for you managing to complete this before the deadline. Condensed, you say? About how much? Oooh, a rather professional looking Adventure Game. About prostitution. From some AGS folk! One of them none other than Magical Smiling Cat! Ah man, I am loving how this competition is turning out. Quite a bit, really. 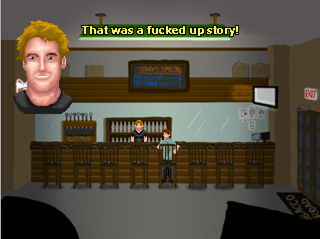 This game features 3 "vignettes" with customers you can play through, whereas the full game would have had the customers as an introduction to the character, then involved a bigger story relating to the other two games. Still, this game should be an entertaining diversion, offering at least an hour of gameplay depending on how you play it. Sweet! Looking forward to it guys! Best of luck Mr. Smiling Cat. WE MADE IT! IT'S UP! Just got through it for the first time. I got pretty much the worst ending possible! I really like the pacing, nice and quick. The font reminds me of LSL3, which is good. Can't wait to see the rest of the endings! Ok found a bug [highlight to read]: When you hide from the guy's wife in the closet, after the wife goes to the bathroom to get ready, she repeats what she said to the guy before going into the bathroom. From then on, you can't leave or do anything: if you try to leave, the wife says "where do you think you're going?" Downloaded, will check it out later. EDIT: BTW, you are on the IndieGames blog! That was really fun. How many endings are there? I can't wait to play and see'em all! So I found a bug. When the wife came home I hid in the closet, she said her dialogue, went in the bathroom, then said it all again, and whatever i clicked on just said "where do you think you're going?" I got that too - I think it only happens if you blackmail the guy. Also, is it possible to save the old lady? I was able to find the pills, but I could find no way to administer them. Making the speech bubble appear just made the woman say nonsense, and clicking on the bed just made the message "I don't think that is a good idea now." appear. The one ending with the younger woman was hilarious! With the other endings in that story, I caught a very Catcher In The Rye vibe. This game made me want to learn how to use AGS. Good work! You can save her by examining her bag to call for help. The person on the phone will give you advice for which pill you need to use. Then go the bathroom, choose the blue bottle and if you're in time you will automatically go to the old woman and save her. Or at least that's what happen to me.